This is a bit of a first and a bit of a suggestion. 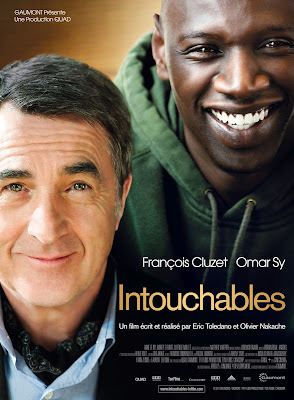 If you like foreign movies even a little bit, you have to see The Intouchables. The basic story is that a quadriplegic lost his zest for life. Everything is mundane until he hires a new nurse who opens his eyes to life's possibilities again. It is full of humor and actually focuses very little on the obvious fact that one of the friends can not get out of a wheel chair. Uplifting and incredibly eye opening this is actually based on a true story. I got to see this with my whole family. My dad and I were the only ones that had to read the subtitles though. This is definitely now on my top 10 for all time favorite foreign movies. Does it bother you read subtitles? What are your favorite foreign films?